Click on the photos below to see our galleries. Thomas Percetti Construction, Inc. is the ideal choice when builders or general contractors have a fiberglass balcony project. Whether the project includes an apartment balcony, townhouse balcony, or a condo balcony, our fiberglass fabrication is the perfect waterproofing solution. Our process includes applying our seamless waterproof barrier over ½” resin coated AC plywood that we install. 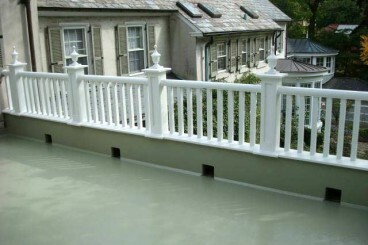 Once the fiberglass balcony is ready to be completed, we will apply a non-skid gel coat color of your choice. Thomas Percetti Construction, Inc. has been a fiberglass deck builder for over two decades in the Eastern Pennsylvania/New Jersey area. 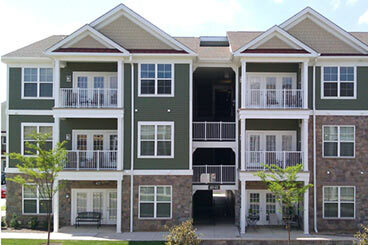 We are a premier subcontractor for apartment contractors and home builders. Our fiberglass deck areas provide seamless, waterproof areas that are very low maintenance and cost-effective. Our fiberglass shower pan liners are fabricated onsite in any shape or size. The benefit of having a fiberglass shower pan over a vinyl pan is that there is no seams with fiberglass and no gluing and folding in the corners. This eliminates the problem of the wonder board pushing out and allows for straighter ceramic tile lines. Fiberglass decks done by Thomas Percetti Construction, Inc. are the decks of choice. Fiberglass decks are a unique product that allow you to have a deck as well as a roof to areas below the deck. You can enjoy a beautiful deck and have peace of mind that it will keep the room below safe from water. When done correctly, fiberglass decks, can last a lifetime. They require very little maintenance. Pressure treated decks or cedar decks need to be sealed every year while fiberglass decks only need fresh gelcoat applied approximately every ten years. We would like to provide a unique alternative to builders, architects, and homeowners to include fiberglass decks as part of their plans. Our fiberglass shower pan liners are custom built onsite to any builder or architect specification. 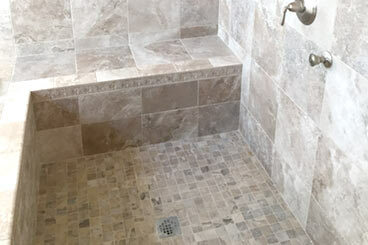 Any shape or size fiberglass shower pan can be made seamless. We can accommodate any curb design whether it be many inches or none at all. We specialize in fiberglass curbless shower pan liners that are perfect for walk-in showers or for handicapped-accessible showers. With a vinyl pan, you are clamping to the drain which allows for leakage. With our fiberglass shower pan liners, we are bonding down into the drain. This assures that there will be no leaking at the drain that is typically found in other so-called water proofing products. Traditionally, once we have completed the fiberglass pan, wetbed and tile are applied for the finishing touches. Our fiberglass decking is also a perfect application to waterproof a flat deck roof. Our fiberglass roof deck installation provides an outdoor living space. Roof decks are a great alternative for areas that do not have a yard. A finished roof deck can showcase an outdoor kitchen area and patio furniture while being functional as a waterproofing application for living space below.